Penzey’s and Katz’s . . .
We picked up Jim and Debbie at the motel about 10 am and headed downtown to The Heights area to visit Penzey’s Spices. Penzey’s has pretty much every spice and seasoning you can think of, and some you probably didn’t know even existed. Jan and Debbie had a blast running around looking at and showing things to each other. Jan also had a shopping list from our daughter-in-law Linda, who also loves the place. Eighty dollars later we were out the door and very well spiced. It was a little early for lunch so we drove around The Heights area for a while looking at all the neat old houses. Finally, we headed down to the Montrose area to eat lunch at Katz’s Deli, a New York Jewish-style deli right here in Houston. We’ve eaten here several times and have always enjoyed it. They have the best Rueben you’ve ever wrapped your mouth around. And that can be difficult because the sandwich is about 4 inches high. And delicious, too. Katz’s Deli has been famous in New York since 1888, and about 10 years a family member decided to bring the New York deli experience to Houston. And it’s been a booming success ever since. Leaving Katz’s we took the long way home to show Jim and Debbie the Astrodome area and other parts of Houston. 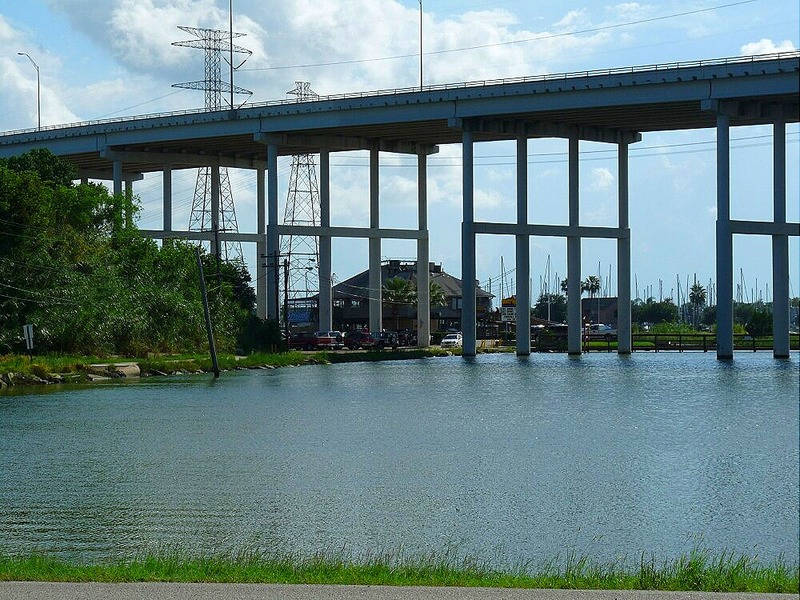 Coming back to this area we took a detour through the Kemah Boardwalk before getting back to the rig about 3:30 pm. Then about 5 we drove up to Webster to have dinner at Genghis Grill, a Mongolian BBQ place that we’ve eaten at many times. When you’re seated, you’re given a stainless-steel bowl and directed to the food line. Your first selection is your meat, or meats. 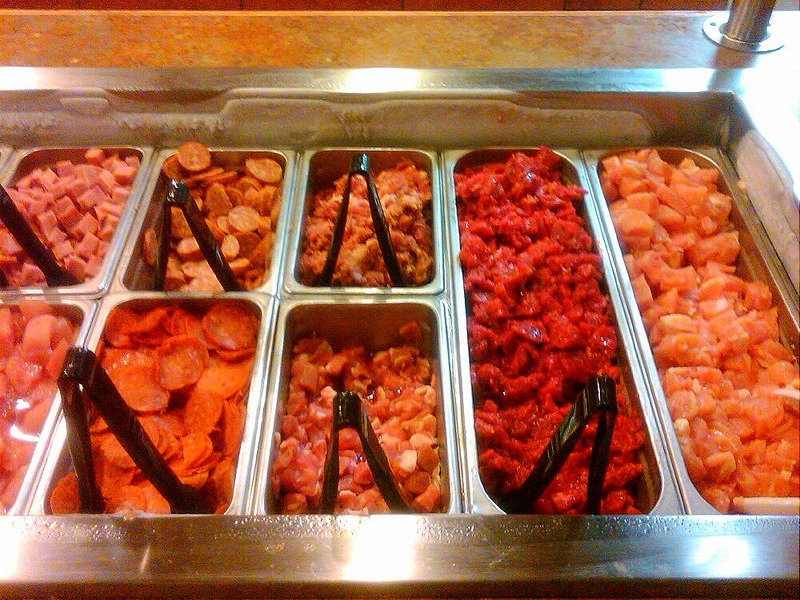 They have beef, chicken, pork, sausage, pepperoni, ham, shrimp, scallops, tofu, etc. Take your pick. 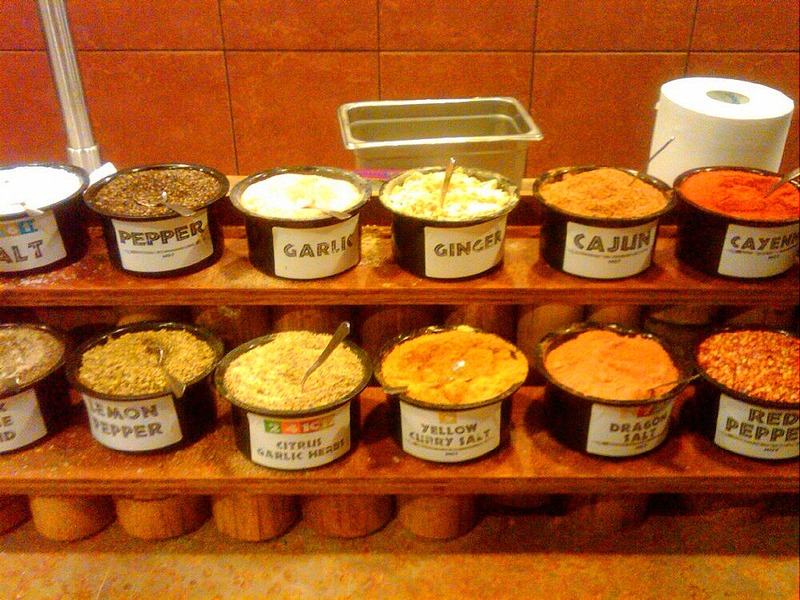 Next, you pick your choice of spices, from hot to spicy to savory. 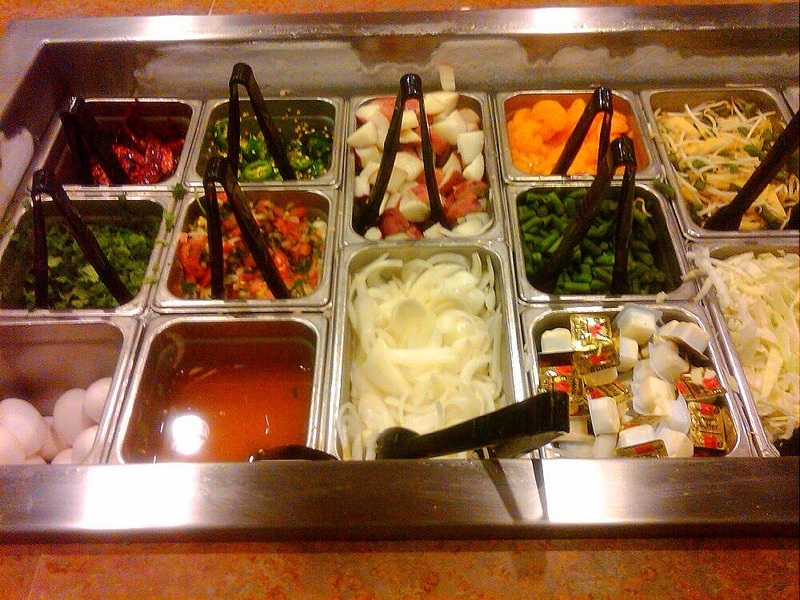 Then it’s on to the Veggie area. This photo shows only about a third of what’s available. You just keep piling everything in your bowl. Finally, you have your pick of sauces, some sweet, some tart, and some very, very spicy. 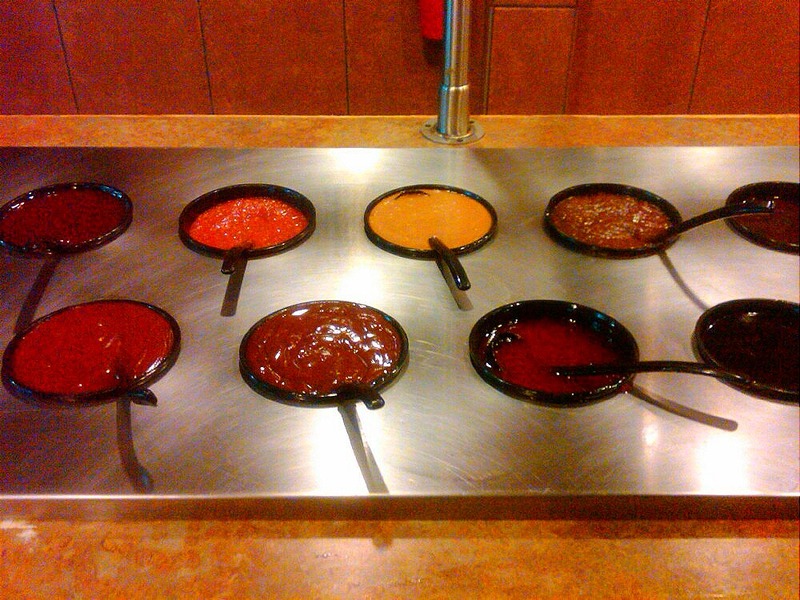 Your sauce selections go in a separate small bowl. Then you hand your food bowl and your sauce bowl into the guy at the grill, and tell him what kind of rice or pasta you want. He gives you a number and you head back to your table. A few minutes later your meal shows up. You can either have a single bowl, or for $3 more, you can go back as often as you want. But one bowl has always filled us up. Heading back we dropped Jim and Debbie off at the motel and got back to the rig about 7:15. 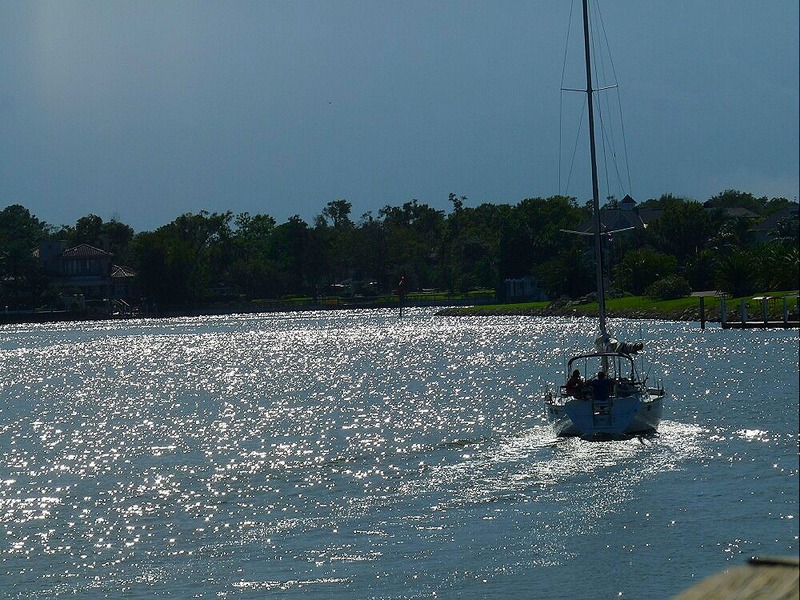 Tomorrow we’re going to take a boat cruise on Clear Lake and then take Jim and Debbie to Outrigger’s for lunch. 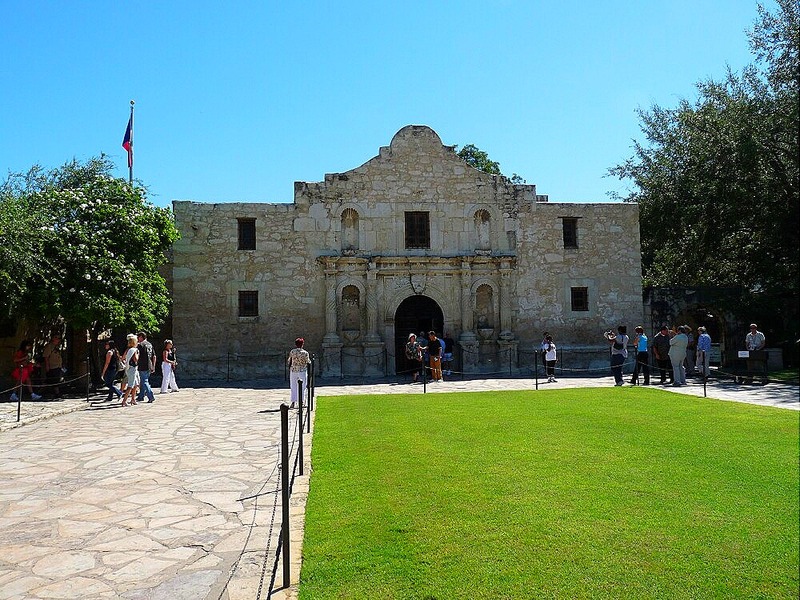 Remember the Alamo. . .
Today was a girl’s day out. Brandi had a doctor’s appointment up in the Memorial City area, so Jan and Debbie rode up with her to take care of Landon, and of course, do some shopping at Memorial City Mall. While Jim vegged out at the motel, I did some errands, and then finished up some computer stuff with a client. Brandi, Jan, and Debbie got back home about 2:30, and I showed up a little later. We all got some Landon time until about 5 pm. 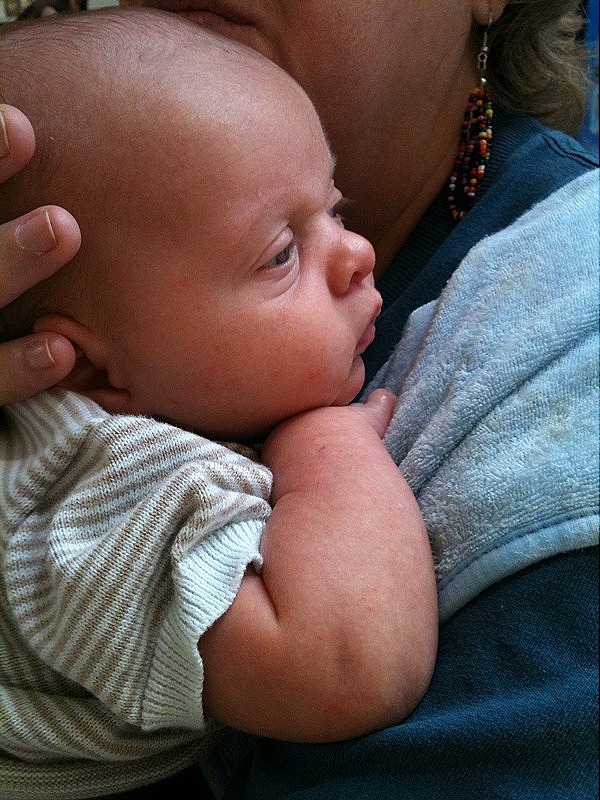 Obligatory photo of Landon getting burped. At 5 pm we drove down to the motel, picked up Jim, and then came back up the road to Floyd’s Cajun Seafood, our favorite local Cajun place. I love their seafood gumbo and boudin, and Jan says their chicken fried chicken with sweet potato fries is fantastic. And as usual, the meal was great. We’ve been eating here for years and have never had a bad meal. The ‘Floyd’ in Floyd’s is Floyd Landry, one of the Landry boys that started the Landry’s Seafood Restaurant chain. They sold the chain years ago and then went out and started their own new restaurants. Floyd owns two here in the Clear Lake area and one in Beaumont, TX. And now back to our day trip to San Antonio and the Alamo. We picked up Jim and Debbie at the motel about 7 pm and hit the road. 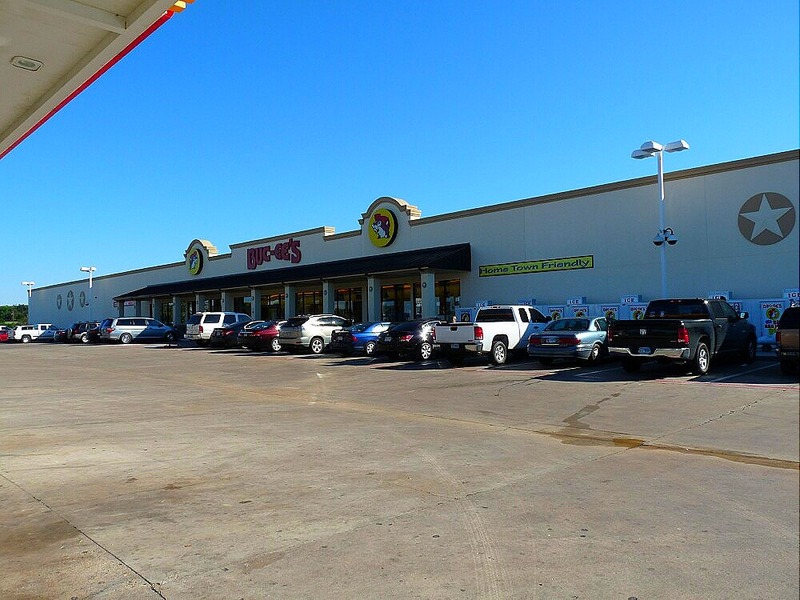 But, on the way, we stopped at the Buc-ee’s at the Luling exit on I-10. Buc-ee’s goes all out on their stores. They just enlarged this one again, adding to the store inside, and doubling the size of the bathrooms. Outside, they made the parking lot much bigger, and can now accommodate many more buses and RV’s. Inside, the store has very large gift shop, in-house candy factory, coffee/cappuccino bar, a bakery, a deli, and a small grocery store. On one side they have an outdoor area that sells firewood, and deer and animal feed. Jan loves their kolaches, and I always get a coffee for the road. 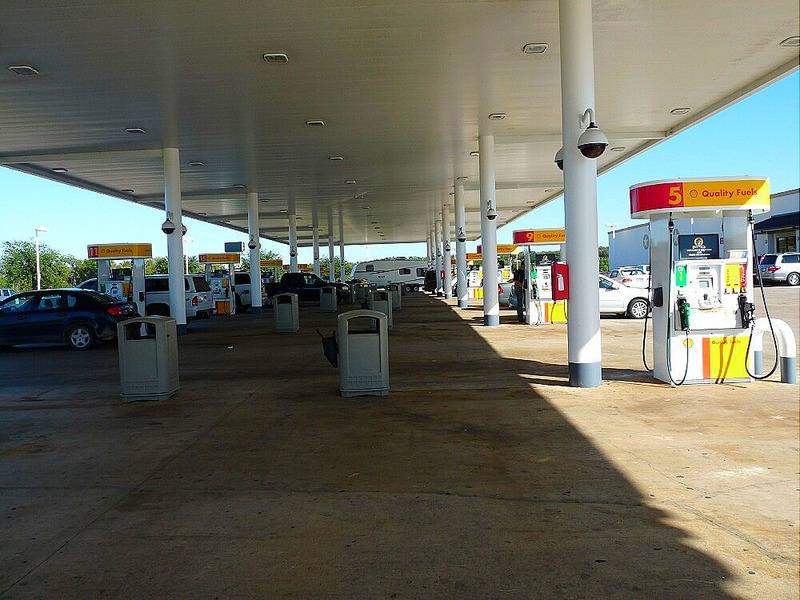 Their gas station has 32 pumps, and, everyone had diesel. Their store in Madisonville, TX has 40 pumps. We got to the Alamo a little after 11 and were able to park only a block away. Luckily it wasn’t a big tourist day. 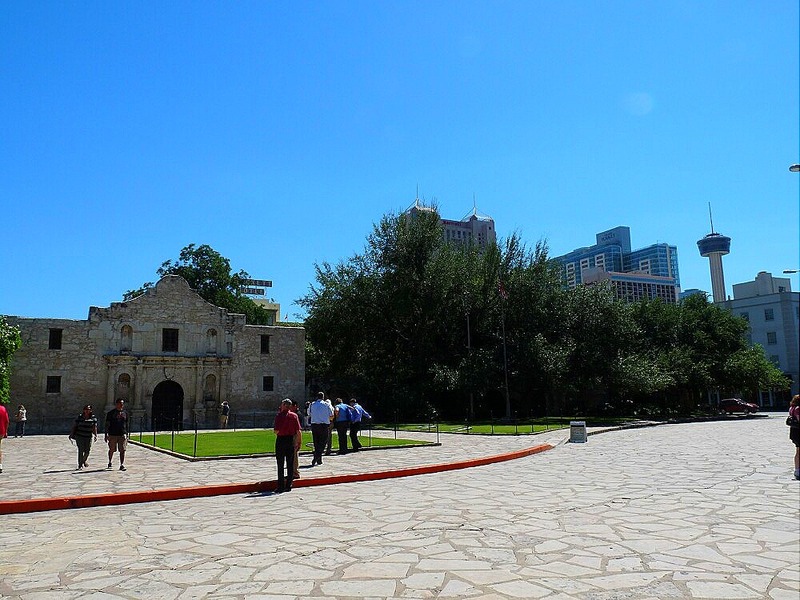 You always see this view of the Alamo, but if you’ve never been there, it’s hard to imagine that it’s right in downtown San Antonio. Here’s what’s right across the street. And here’s a wide view. 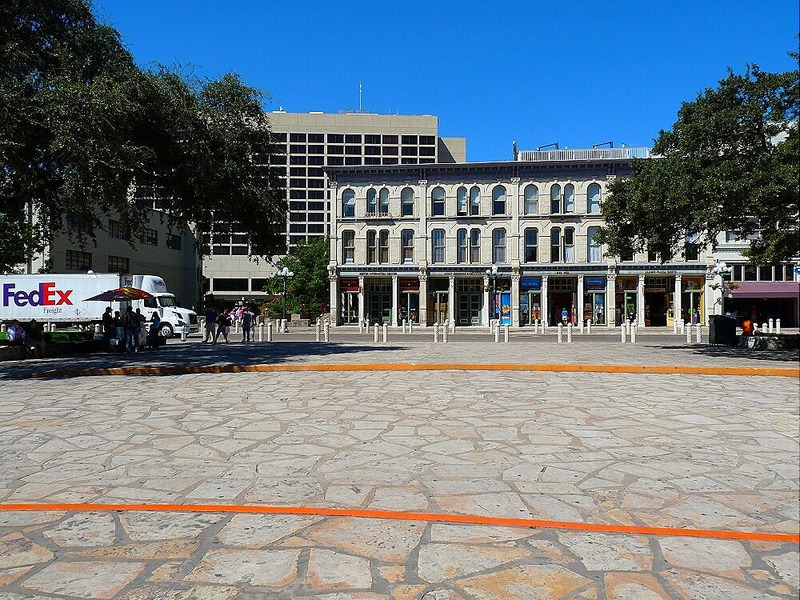 Note that there are no tall buildings near the Alamo. 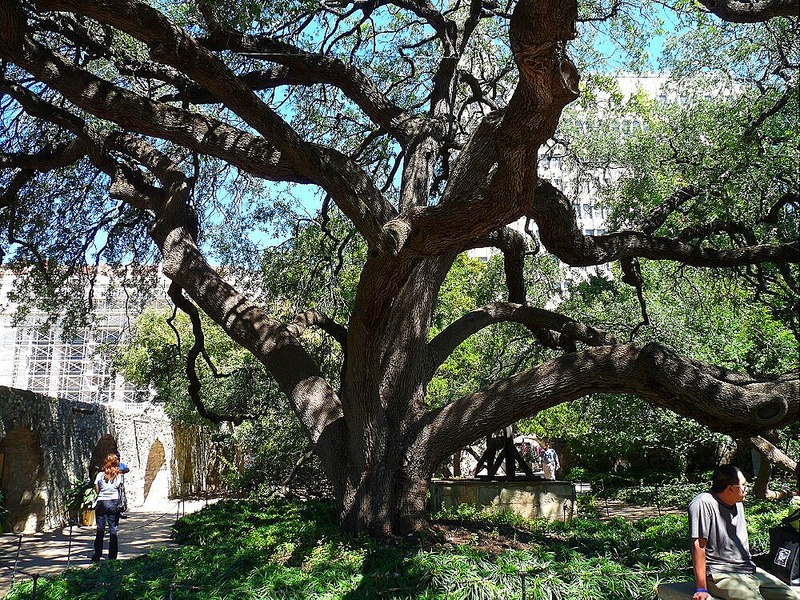 By law, no building can be built that ever casts a shadow on the Alamo. The tower on the right is the Tower of the Americas, built for Hemisfair 68, the first world’s fair in the southwest US. It has a revolving restaurant at the top that Jan and I ate at several years ago. 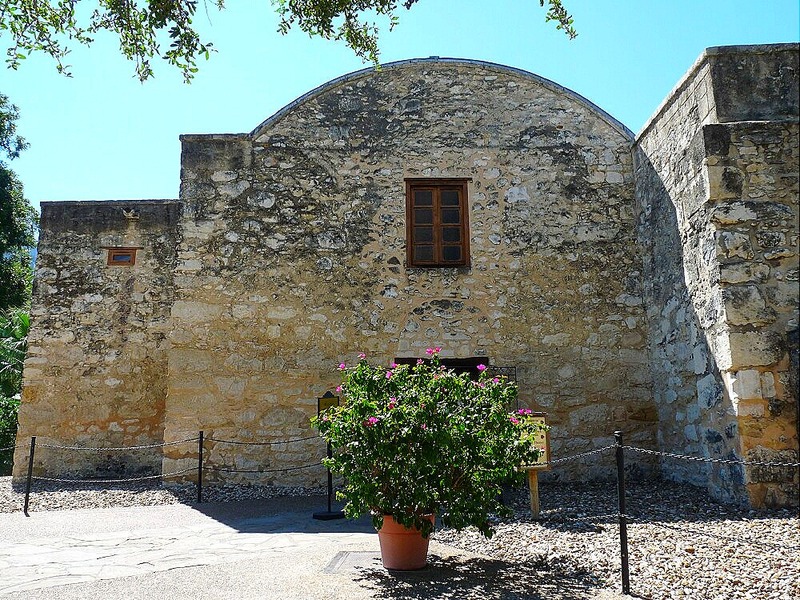 This is the back side of the ‘chapel’, the front of which is the familiar facade that everyone knows as the “Alamo”. 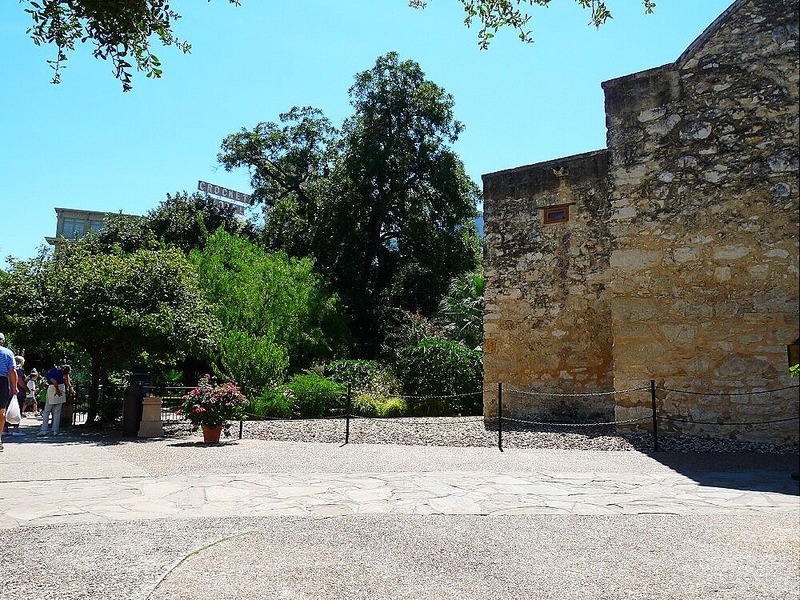 The Alamo was originally a Spanish Catholic mission, but the chapel was actually just a small part of the mission grounds. 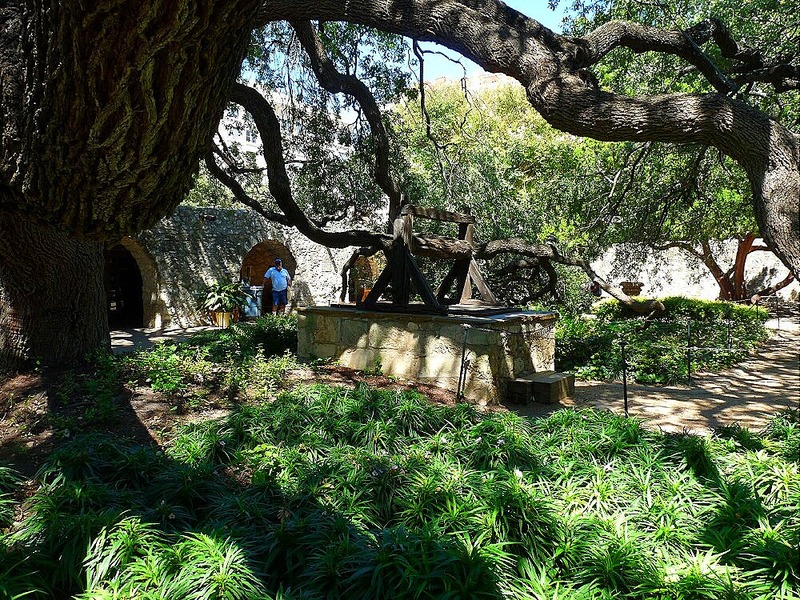 The well in the center of this photo dates from the mission era, but the large oak tree is only about 140 years old, planted about 35 years after the battle, which took place in February and March of 1836. 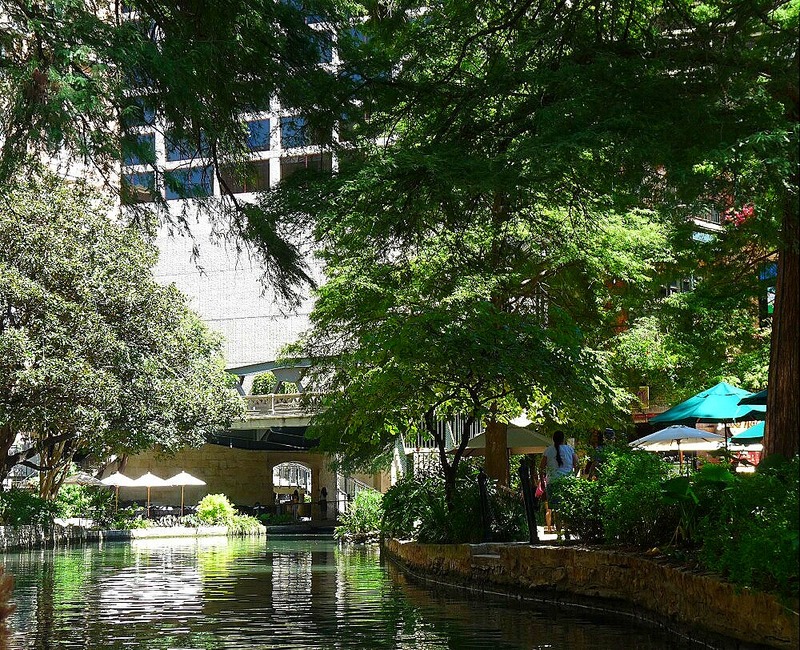 Leaving the hallowed ground of the Alamo, we walked across the street to San Antonio’s other famous landmark, the Riverwalk. 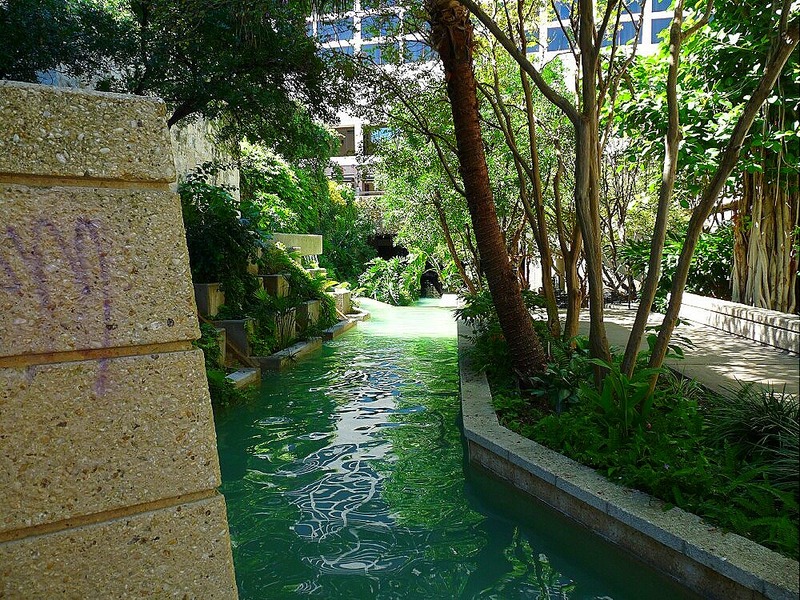 Formed originally as a flood control project by the WPA in the 1930’s by concreting and daming the San Antonio River, the Riverwalk has been extended several times to access new hotels and tourist area such as Hemisfair 68. 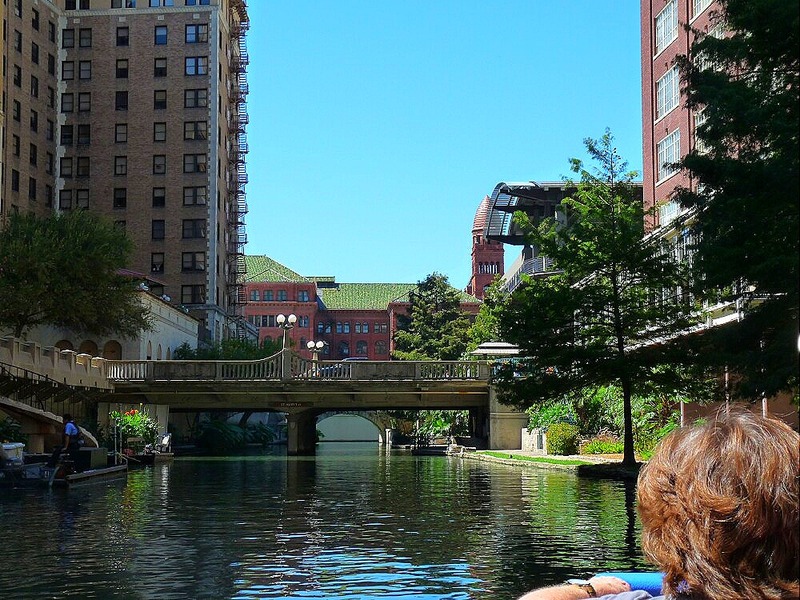 The city of San Antonio was actually named for the river, and not the other way around. 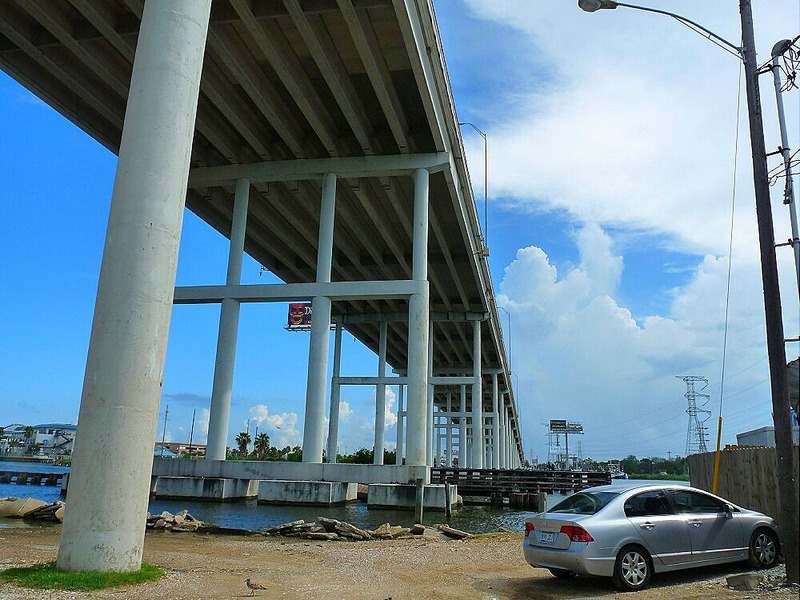 The river was named after Saint Anthony, the patron saint of the area. 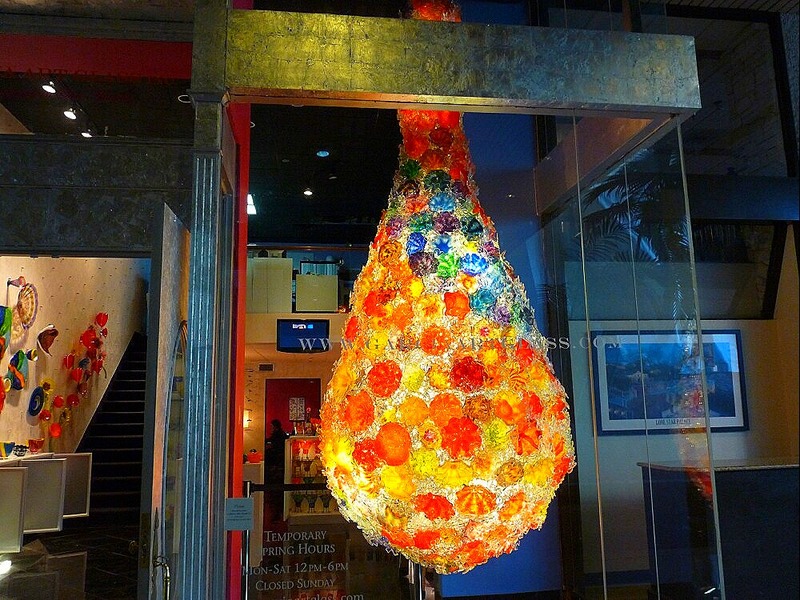 This is the display in a window of one of the many high-end shops along, and adjacent to the Riverwalk. It’s all made of glass. 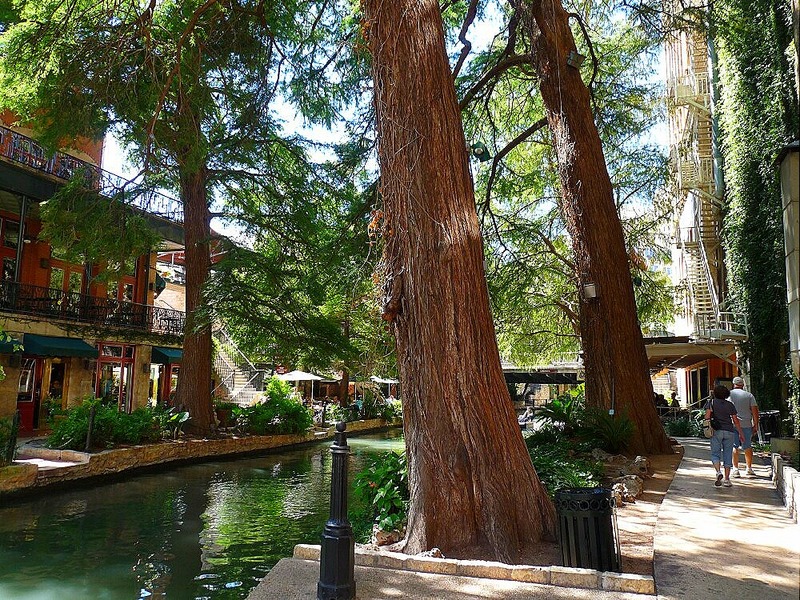 Most of these trees predate the Riverwalk, but were kept for their beauty as it was built around them. 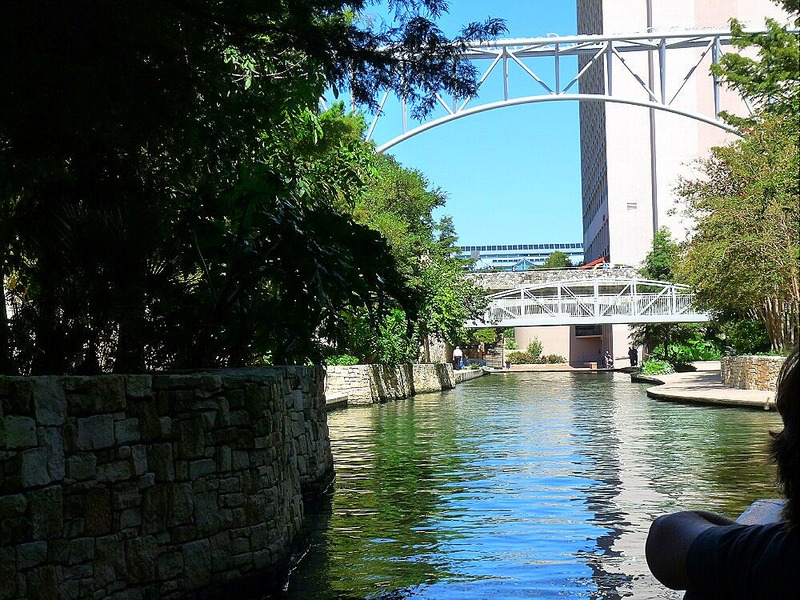 We took a barge tour of the river, which lasts about 45 minutes and gives a lot of history of the Riverwalk and the area. The many vistas are really scenic, with new sights around every bend of the river. 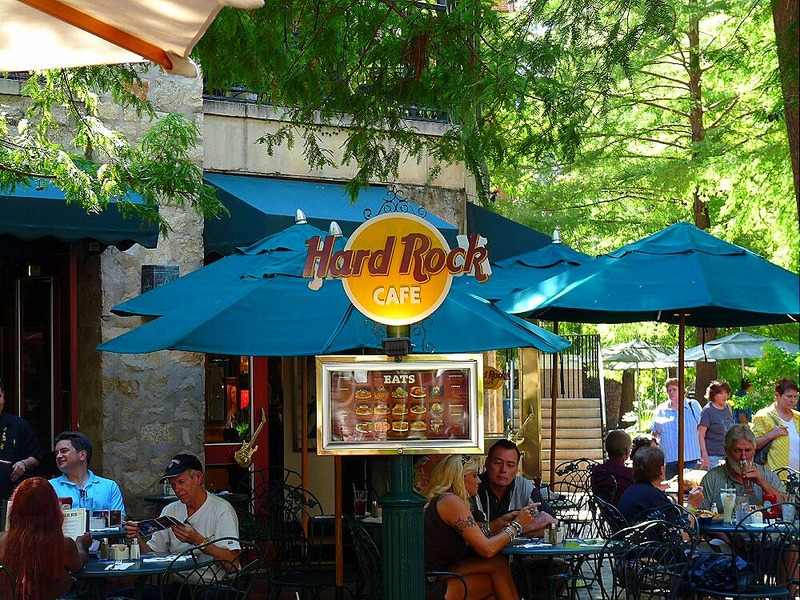 After our barge ride, we ate a late lunch at the Hard Rock cafe right on the Riverwalk, although we ate inside to be a little cooler. We were back on the road to Houston a little after 3 and got back home about 7:30 pm, with a stop at Buc-ee’s on the way, of course. It was a long day, but we had a great time, so it was worth it. 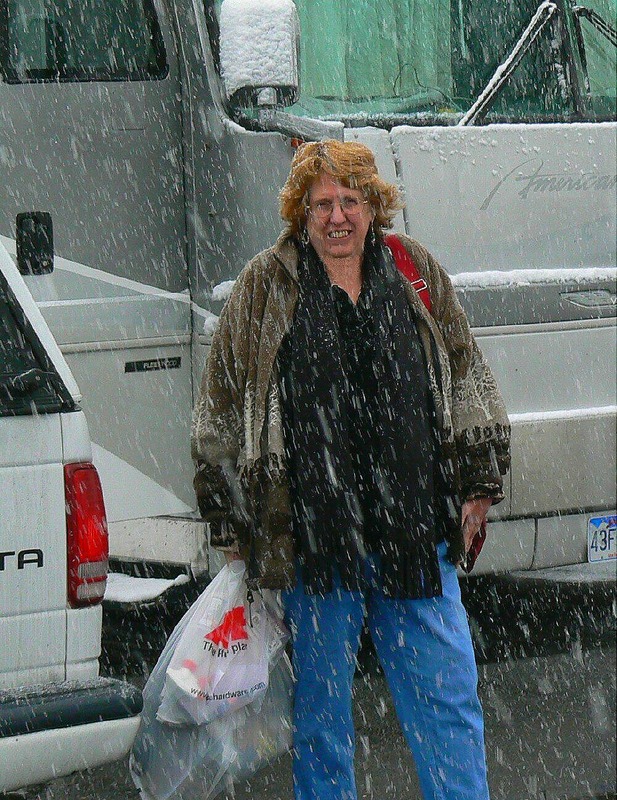 My Beautiful Wife of 43 years! Free people are not equal. Equal people are not free. And eternal vigilance is the price of liberty. The Egg and I & Cafe Adobe. . .
Today started off with breakfast at Egg and I, probably our favorite local breakfast place. We also like Jimmy’s Egg, but for some reason, perhaps because they have flavored coffees like hazelnut, we like the Egg and I better. 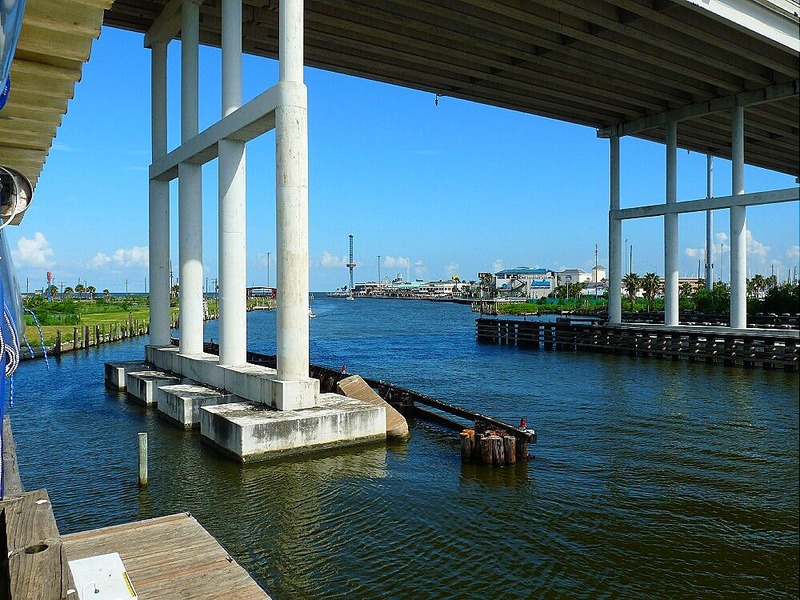 Then we headed about 30 miles south to Galveston Island to show Jim and Debbie around, and also check out the changes since Hurricane Ike. We drove west along the Seawall all the way to Jamaica Beach. Along the way, we stopped to check out the Jamaica Beach RV Park, which is right across the street from the ocean. 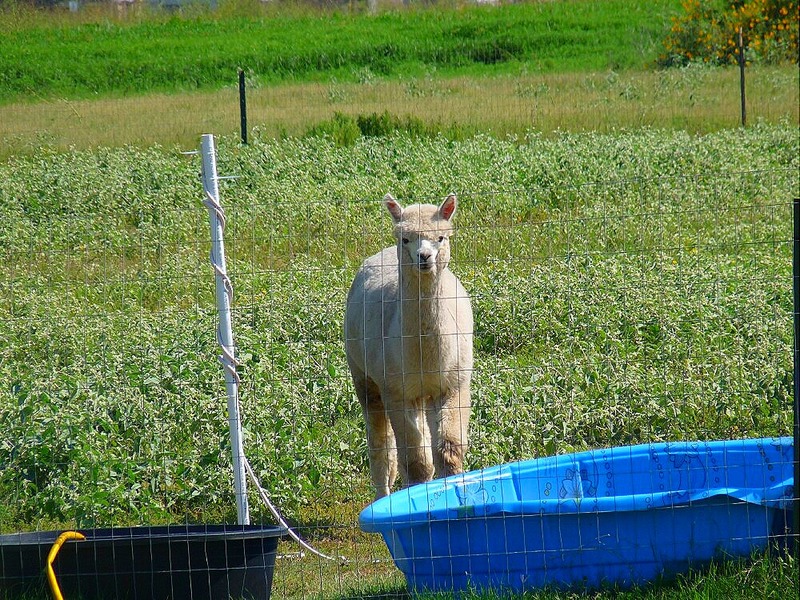 For some reason the park comes with its own alpacas. We looked it over and got a brochure and a rate chart. It’s a nice park and we might stay there on our way out of town some time. Coming back we drove into town to drive around the Strand area, and thru some of the neighborhoods looking over all the old, but beautifully remodeled homes. Based on what we had heard the Strand looked like after Ike, the area has really come back. Leaving the Strand, we drove back over to the Seawall to get some ice cream at Ben & Jerry’s, and then headed back east to Murdock’s Souvenirs. I’ll have more about Murdock’s in the next couple of days. 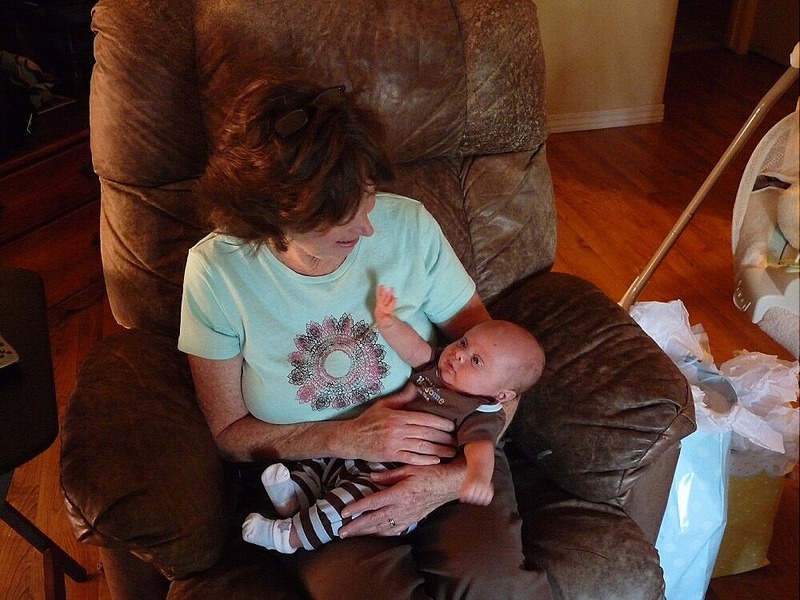 Coming back from Galveston, we stopped by Brandi’s so Jim and Debbie could meet Mr. Landon. Jim and Debbie also had to pass Kitty’s inspection. 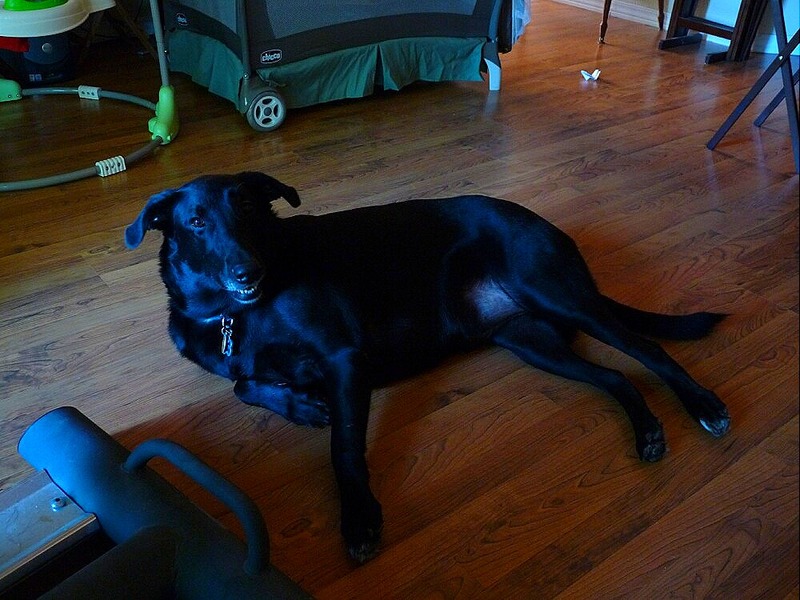 Kitty (Yes, this 105 pound Black Lab’s name is Kitty) is very protective of Landon, and if Kitty doesn’t know you, the dog will keep trying to squeeze in between you and Landon. A little before 5 pm the whole gang met at Cafe Adobe for dinner. Here’s a photo suitable for a Most Wanted poster. 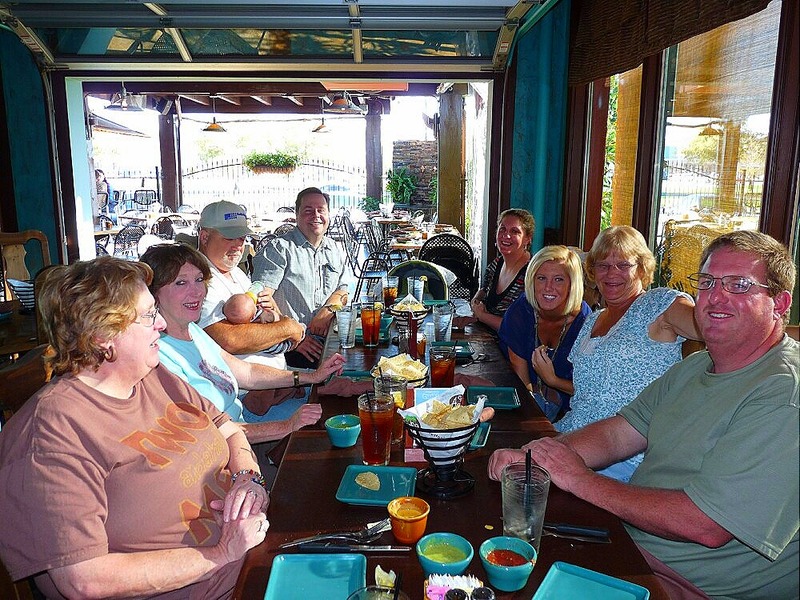 From left to right: Jan, Debbie, Jim, Lowell, Landon, Brandi, Piper, Linda, and Chris. And here’s Mr. Landon sleeping through all the commotion. He looks like he’s ready for a fight. And here’s Debbie, with Jim getting in some Landon feeding time. Jim and Debbie’s youngest grandchild is 1 yr. old, so he’s not as out of practice feeding a baby as I am. Leaving Cafe Adobe about 6:15 Jan and I dropped Jim and Debbie at the hotel, and then headed back toward the rig, stopping off at Buc-ee’s to fill up with gas. 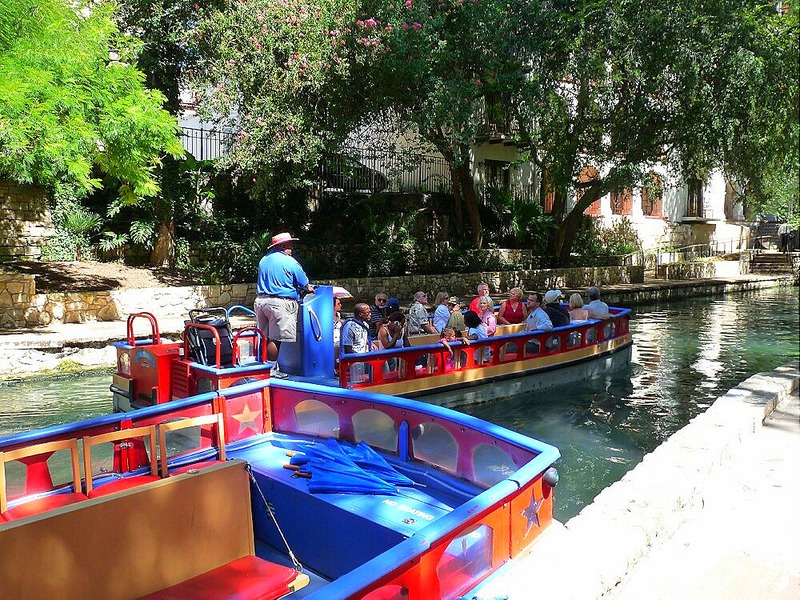 Tomorrow we’re planning to head over to San Antonio to see the Alamo, the Riverwalk, and other sights. But…when we got home tonight Jan started feeling bad, so we’ll have to see how tomorrow goes. 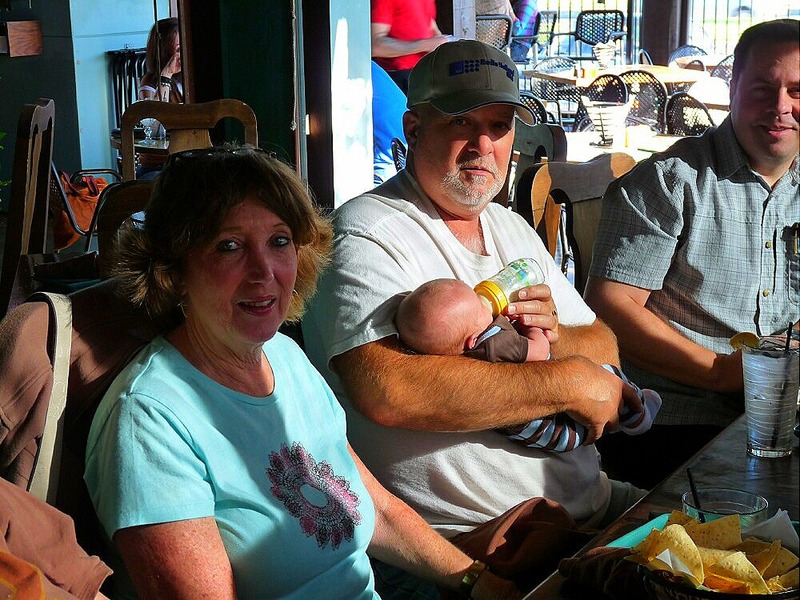 Today is the day we’re expecting Debbie and Jim, Jan’s sister and brother-in-law, who are driving down from southern IL to spend a week with us, and get acquainted with Landon. They called about 12:15 saying that they were just getting off I-10 onto SH 146, so I figured they should be here about in about 45 – 60 minutes. About 90 minutes later they called to say they were lost. After they described where what they could see, I realized they were just 3-4 miles up the road, so Jan and I jumped in the truck and drove up to meet them. We decided to go ahead and head over to League City and get them settled into their hotel. After that we all came back to the rig and settled in to talk for a while and catch up on things. About 5 pm we drove over to Dickinson to Monterey’s Little Mexico for supper. Debbie had said she was looking forward to some good Nachos, and Monterey’s are really good. Jan gets them all the time. I know what Debbie means about finding good Nachos. Some places around the country have some very strange notions about them. The most common weird ingredient is BLACK OLIVES. Yech! And to compound this blasphemy, NO JALAPENOS! We’ve also seen lettuce, goat cheese, green peppers, and green olives as toppings. I’m sorry. That’s just WRONG! Anyway, after dropping them off at their motel, we got back to the rig about 7 pm. Tonight is the premiere of Amazing Race and Desperate Housewives, so Jan’s in high cotton. But I am really enjoying the cool fall weather Jim and Debbie brought with them from IL. In the last week the temperatures have dropped from the mid 90’s in the day time and the mid 70’s at night, to the low to mid 80’s and the low 60’s and high 50’s. Tomorrow night we’re all getting together at Cafe Adobe for dinner so Jim and Debbie can see everyone. With all the different work schedules, it’s the only night we can do it while they’re here. Cellphone Crashes and Car Seats. . .
Not much bloggable went on today. Left the rig about noon to see a computer client in Pearland. Left the rig about 4 pm to head over to Cafe Adobe to meet some friends for dinner. This is our first time to eat at this new location since it opened while we were gone this year, and we were really looking forward to it. However Jan and I were both kind of disappointed, since it wasn’t as good as we remembered from another location. It wasn’t bad, just not great. We’re going to eat there again on Monday night with Debbie and Jim, Jan’s sister and brother-in-law, and all the rest of the family. So we’ll give in another chance. After dinner we went over to our friend’s Connie and Herman’s house to look at a computer problem Connie’s having. We got back to the rig about 10:30. For not doing much, it sure seemed like a long day. For example, I found this chart the other day in an article about the so-called dangers of using a cellphone while driving. 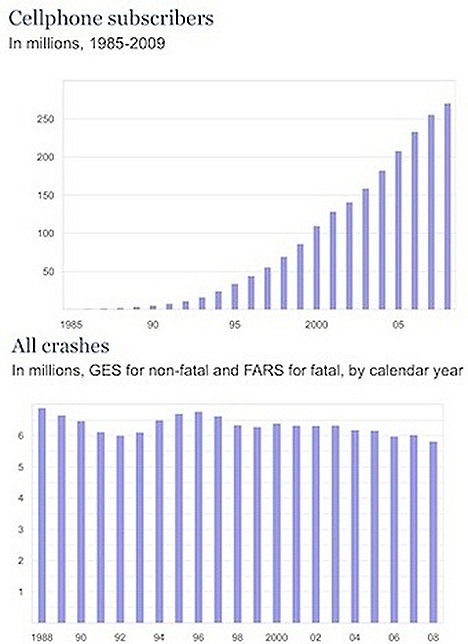 Note that in the last 10 years the number of cellphones has almost tripled, but the number of car crashes has been dropping pretty steadily during the same period. If cellphones were so dangerous, wouldn’t you think that the number of crashes would be rising, at least noticeably? I mean, I’ve read some articles that say that using a cellphone while driving is the equivalent of driving drunk. As it turns out, analysts think that the reason this is happening is that cellphone usage is replacing even more dangerous driving habits, like driving with your knees while you’ve got a burger in one hand and a drink in the other. Like, reading a newspaper propped on the steering wheel in front of you, putting on makeup and plucking your eyebrows in the mirror, shaving, and my personal favorite, conducting the music on radio with a conductor’s baton in one hand. Personally, I think that airbags have caused a lot of crashes all by themselves. Anyone remember how we got airbags? The government didn’t think people were using their seatbelts enough so they make the car manufacturers install switches in the seats, so that if someone was sitting there, and if the seatbelt wasn’t fastened, then the car wouldn’t start. But this caused such a revolt from the public that the government decided that, if people weren’t using their seatbelts, then they would give us airbags instead, since those were automatic. But then it turned out that airbags were very dangerous without seatbelts. (Don’t believe me, try Googling “airbag decapitations”) So now we got both airbags and seatbelts. Next, they discovered that, even with airbags AND seatbelts, it was very dangerous to have a baby in a carrier in the front seat. 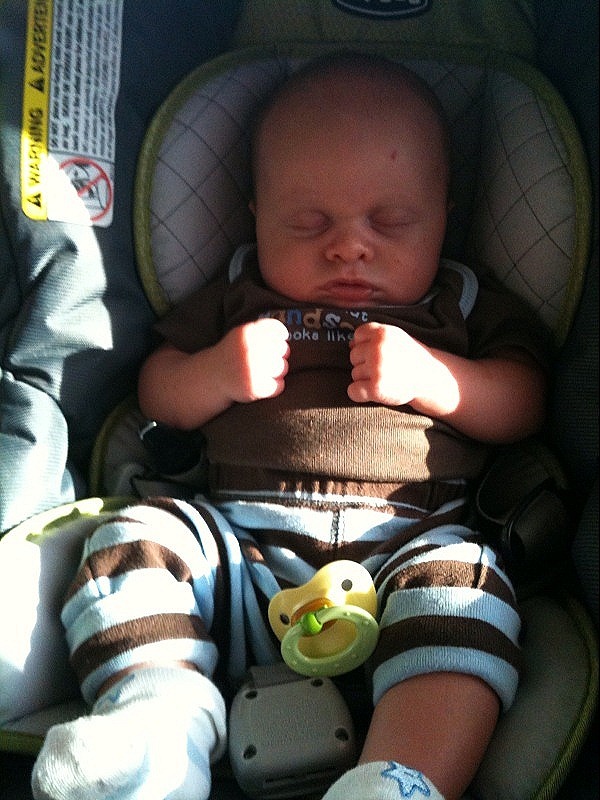 So now babies in their carriers are supposed to be in the back seat. Then, BAMMM! Someone stops in front of them. And for what it’s worth, I think that rear car seats are also responsible for at least some of the cases where parents accidently leave a baby in a car. That is hard to do when the baby is in the front seat, and it sure seems like we hear about this happening more in the last few years. Well, that’s it for today. Discuss among yourselves. Today, as usual, we start with the requisite Landon photo. 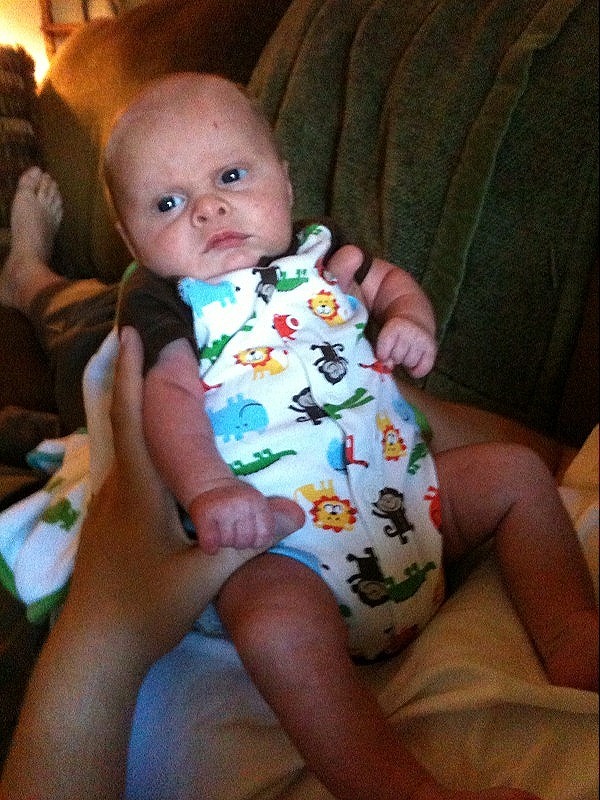 He looks like he’s not too sure what’s going on, but whatever it is, he doesn’t like it. Forgot to mention this yesterday, but when were in Ryan’s last evening, Jan looked around and said she kept waiting for the Amish to come in. When we would visit Ryan’s in Elkhart IN, we always saw a large number of Amish eating there. Apparently, Ryan’s is very popular with the Amish for some reason. Nick Russell called a little after 1 pm, so we could catch up and solve a few more of the world’s problems. They’re in the Gettysburg PA area, and say it’s well recommended as a great place to visit. 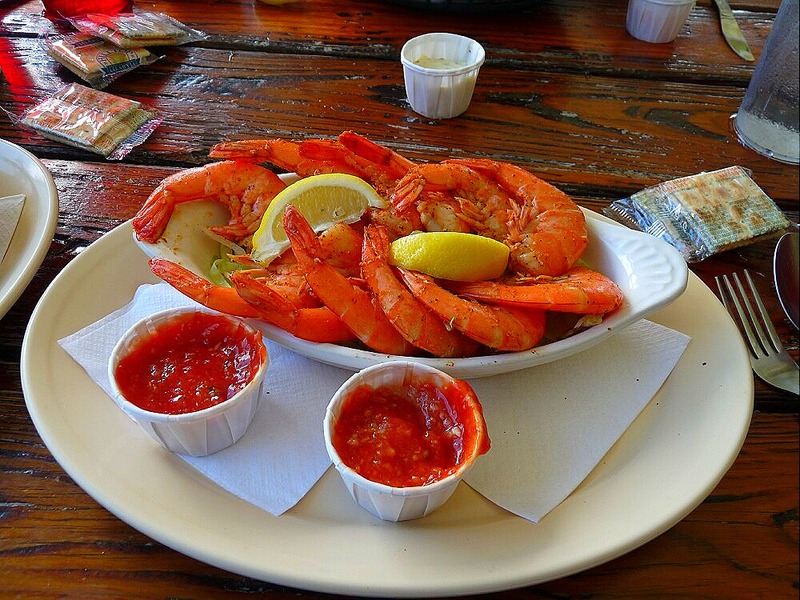 About 3 pm we drove up the road to Outriggers, our favorite local on-the-water seafood place. 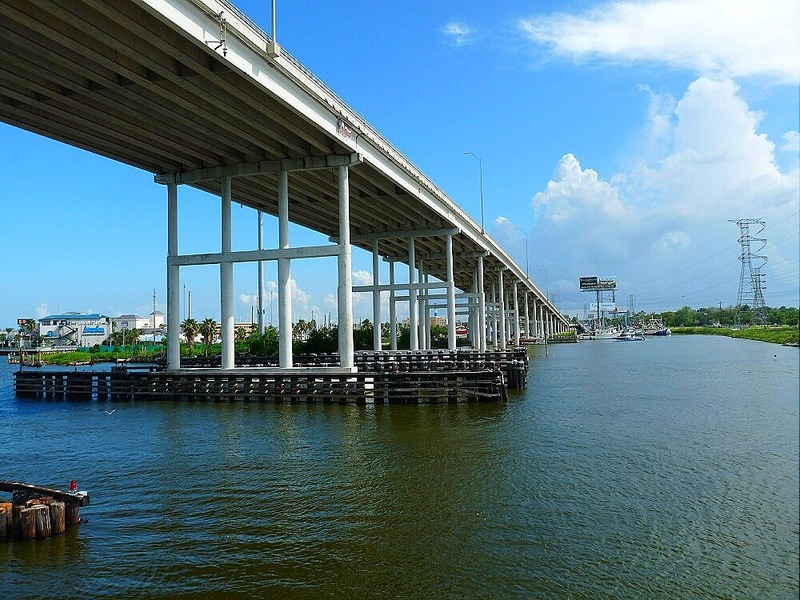 In this case, on-the-water means on the Clear Lake Channel, connecting Clear Lake with Galveston Bay, and under the Kemah Bridge. 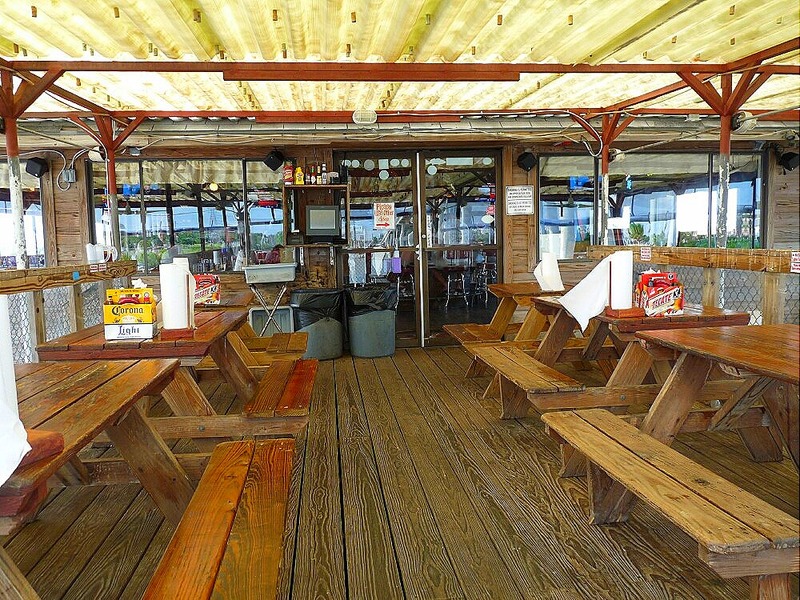 They have a great open-air deck overlooking the Channel. And the view is great, too. Of course, the food was great, too…as usual. 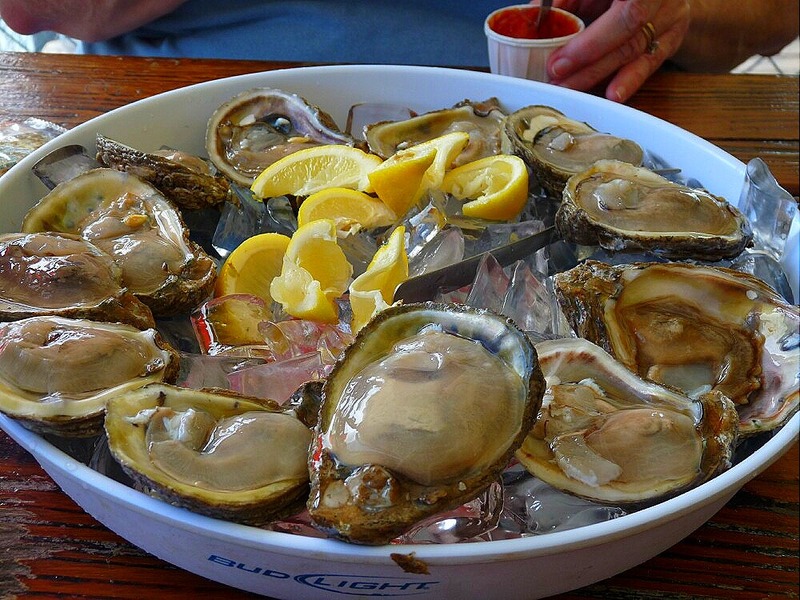 We started off with a dozen raw oysters. Our waitress said we were lucky as the season had just started, otherwise they wouldn’t have been available. For our entrees, Jan had a Shrimp and Oyster Po-boy, and I had a cup of Red Beans and Rice, and a dozen Boiled Shrimp. 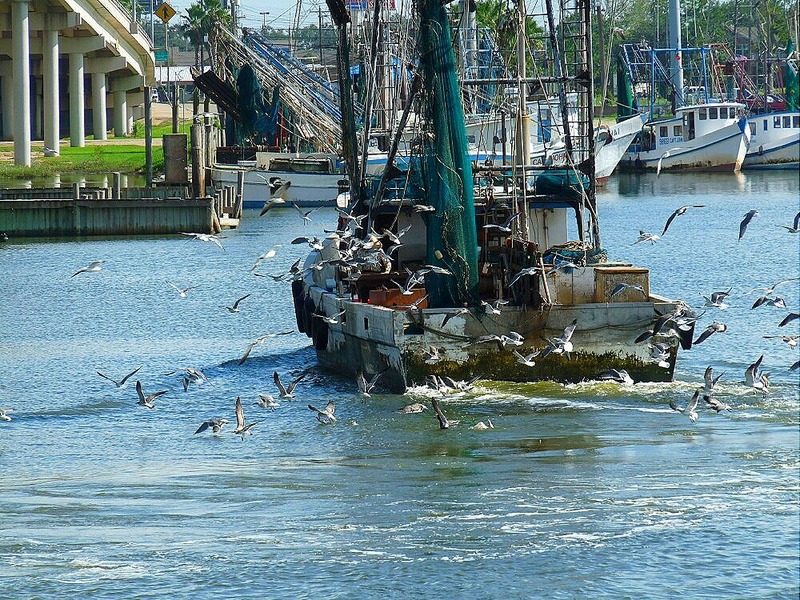 While we were eating we saw a shrimp boat come in to dock, followed by a large flock of seagulls. 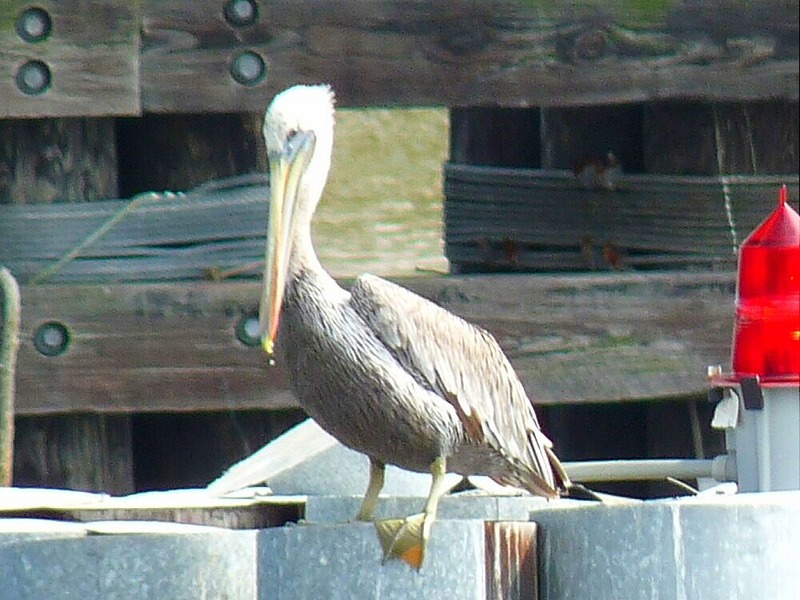 Deckhands usually are washing the trash fish off the deck thru the scuppers, and into the water. And the seagulls are always looking for a handout. 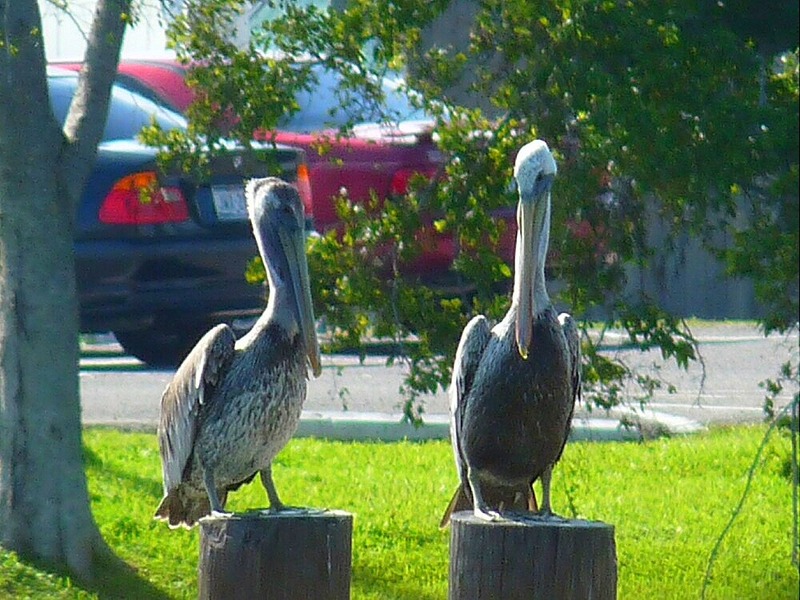 Also nearby, we saw several of Jan’s favorite birds, pelicans. We’ll probably try to bring Jan’s sister, Debbie and her husband, Jim, here next week. The Bill of Rights: Another bill members of Congress haven’t read.